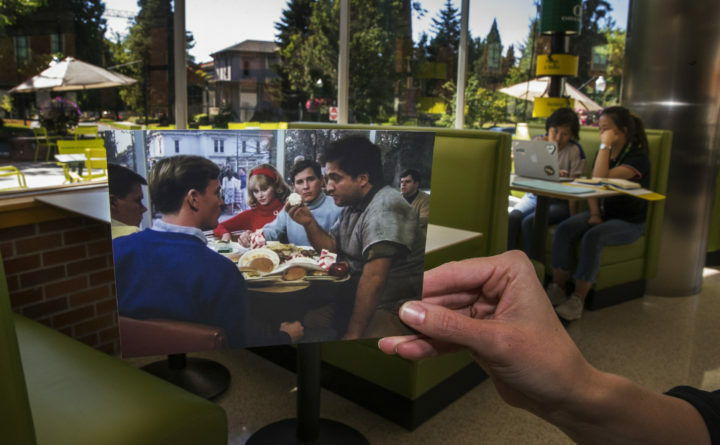 In this July 27, 2018 photo, a photograph from the movie "Animal House" is held up in the ERB Memorial Union on the University of Oregon campus in Eugene, Oregon. Verna Bloom, the actress who portrayed the wife of the dean in the movie “Animal House,” has died. She was 80. In the 1978 John Landis film, Bloom played Marion Wormer, who flirted with and had a drunken romp with fraternity president “Otter” Stratton.